Sign up by December 5, 2018. HockeyMania is an exciting sweepstakes fundraiser based on professional hockey. All game cards have an equal chance to win $1,000s in prize money based on the performance of the random hockey teams printed on the back. Game cards contain 3 random teams in each of the last 15 weeks of the pro hockey season (you get 3 new teams each week). To play the game, participants simply add up the goals scored by their 3 teams. Every week, the 10 highest scoring game cards, and the 4 lowest scoring game cards all win prizes… a new chance in each of the 15 weeks of the sweepstakes! There are 4,060 unique game cards, each of which has a minimum 1 in 19.6 chance to win a prize during the season. Number of winners and odds vary depending on the fundraiser chosen (see below). Learn how our HockeyMania fundraiser works. This is a great video to learn how the game is played. HockeyMania is an exciting sweepstakes fundraiser based on professional hockey. Sweepstakes participants can win $1,000s in cash prizes based on the number of points scored by the hockey teams printed on the backs of their sweepstakes game cards. Sweepstakes participants can win $1,000s in cash prizes based on the performance of the randomly assigned professional hockey teams on their Game Cards. 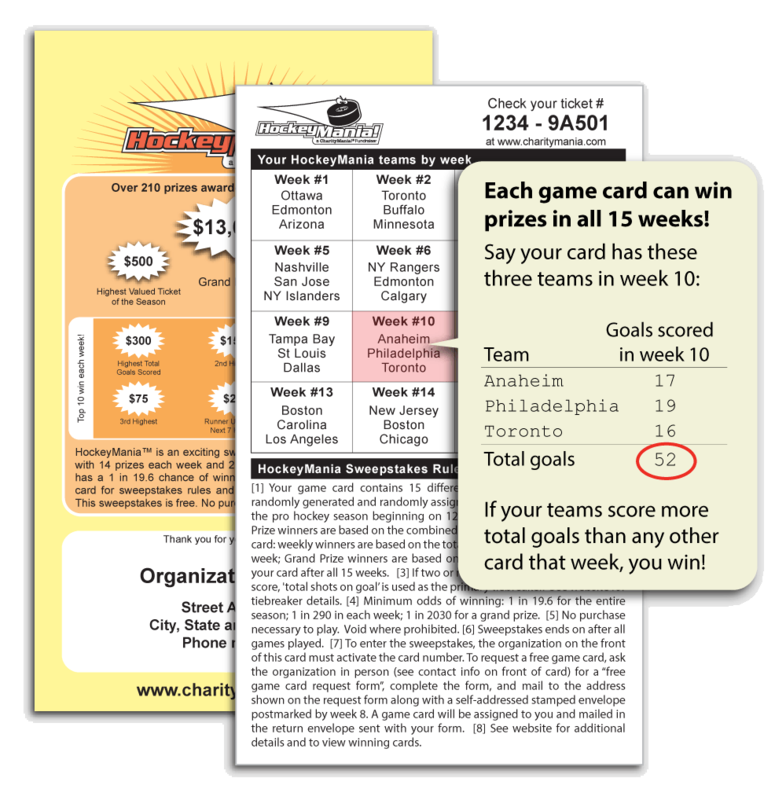 Each week CharityMania calculates the winning game cards. We then send you the prize money so that you can send it to the winners with a personalized letter thanking them for their support. HockeyMania begins on December 17. Make sure you order your tickets early enough to distribute and sell them before the sweepstakes begins.